A movie that turns out to be much better than it looks, as it’s second half becomes full of surprises and clever ideas. Contraband looked like it would be incredibly lousy. Giovanni Ribisi’s voice in the trailers, alone, was enough to turn me off from this film. But so was the premise about a guy who is retired and used to be the best at doing something illegal, but now has to get back into it to save a family member. He now has to do one last job. That has got to be one of the most clichéd premises around these days. The latest one, in theaters now, is a movie called snitch, starring the rock. I suppose this kind of movie, about a retired ex-thief going back for one last job, probably dates all the way back to the Hitchcock movie, to catch a thief. Maybe even earlier. So I wasn’t expecting very much from contraband until I realized that been foster was in it. This guy, in supporting roles, is like gold. From Alpha Dog to 3:10 To Yuma, the movie isn’t always good, but you can be sure that been Foster will be. I’m glad he never became and a list star, and hope he never does, because something tells me the movies will stop being so great. Foster was the actor who saved the movie the mechanic. Without him, that movie would have been exactly like every other Jason Statham film. Unfortunately Statham is the actor who I could see foster being most like, if he were ever to begin starring in his own films. No thank you. 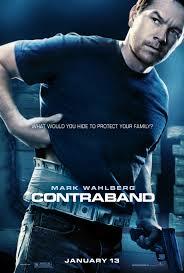 Contraband stars mark Wahlberg as Chris that retired guy who used to be the greatest smuggler on the docks. Now he’s given all that up to live a life of happiness with a beautiful wife Kate, (Kate Beckinsale), and their two children. Foster plays his best friend, Sebastian. Everything seems to be going great for the happy couple until Kate’s kid brother, Andy, does a job for the local boss in town that goes terribly wrong. The boss is Tim brigs (Ribisi), and when the coast guard shows up to board the ship that Andy is on, Andy and his friend throw all of their stolen cargo (drugs), overboard. It’s all gone. And there was a lot of money that brigs had already paid for it. So now its either Andy comes up with that money fast, or brigs are going to kill him. All of this leads to Chris having to do one final job, and go down to panama to pick up a ton of counterfeit bills. If only it was that easy. This is pretty much the setup and first third of the movie. It’s okay, but nothing special. Ribisi is surprisingly better as the villain than expected, because his annoying voice just makes you hate him even more. And we want to hate the villain of the movie, so that’s a good thing. There are some sparks between Chris and the captain of the ship, played by the great J.K. Simmons, and soon Chris find himself in Panama, falling for the first twist of the movie. Let’s just say circumstances lead to him having to accompany the big crime boss in Panama on an armored truck raid. These guys he’s going with are real bad-asses, and you can tell that from the way they tape up their faces to make masks and walk into bullets and death, pretty willingly. I like that the movie took Chris on this path and really gave him no choice, because it is so far away from where he started the film. Even going on the smuggling mission, he was insistent that there would be no drugs involved. Robbing an armored truck and taking on the local police was never a possibility or consideration. There are more twists coming. We get more than one villain, which is always fun, and a few surprises about who these villains are. And while Chris is dealing with hiding things on the ship, his wife is dealing with her own problems back home. When the villains come after her and her family, she has to find a way to deal with it. I like that this movie keeps her actions realistic and doesn’t suddenly give her the ability to kill anyone, the way most clichéd movies about a woman in danger, tend to do. There is a lot of conflict in this movie and it often seems like out of one hole and into the next, or out of the frying pan and into the fire. Even after dealing with the armored truck heist, Chris still needs to make it back to the ship on time, before it leaves the docks. And even once he gets back on the ship, there is a new problem that develops when his cargo is suddenly put at risk. There are a couple of ridiculous close calls, but if you suspend a little disbelief, the movie becomes a lot more fun. The star-studded cast here definitely helps. From foster, who definitely delivers on the expectations that he will bring life to the movie, to ribose, to J.K. Simmons, they got some pretty great actors here in supporting roles. Kate Beckinsale is just okay, but when is she ever anything better than that? And mark Wahlberg, as the star, is also nothing special. I’ve never really thought that Wahlberg was a great actor, and even in some of his better performances (Boogie Nights, The Departed), he always seems to just be playing versions of himself. With this movie, it’s kind of a throw away film as far as acting and characters are concerned, but those supporting players definitely help keep the movie fun. Contraband works because it’s second half is loaded up with surprises and clever plot ideas. The movie begins with a tired and run down premise, but then finds lots of interesting ways to take it in new directions. While we have seen plenty of movies about retired thieves going back for one more job, before, there aren’t all too many movies about smugglers. It’s not a whole lot different, other than that the sneaking around takes place on a ship instead of on land, but when it leads to getting involved in a giant heist that brings to mind the bank robbery of heat (not to mention the armored truck heist opening of that movie), you know you’ve hit on something kind of cool. 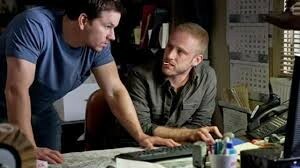 Contraband is not a great movie, but it is certainly fun. It keeps the plot moving and the twists coming, and never lets you get bored or feel too comfortable. For what it sets out to do, this movie is a success.